Crafting Heroes Interview with Meg McElwee Pattern Designer | CraftBoom! This time the spotlight is on the talented (and very busy!) Meg McElwee. Lots of you will already know who Meg is from her fantastic blog which is chock-full of crafty inspiration and help and advice on how to use Montessori techniques to teach children (her little students are sooo cute!). Meg has started her own Craft Business selling her own line of very pretty and very useful sewing patterns. You might like to know the Meg has also written a wonderful post on how to go about publishing your own patterns (the link was sent to me by Melissa of Fehrtrade). In this interview Meg shares with us her experiences of starting up and running her Craft Business. CraftBoom! : How long have you been in craft business? Meg: I officially began selling my patterns in August, after many months of pondering the idea. I’m such a newcomer to this whole craft business thing! It has been a wonderfully positive experience so far. Megs’ Reading pillow pattern makes reading easier (by freeing your hands so you can eat choccy for example) and more comfy. 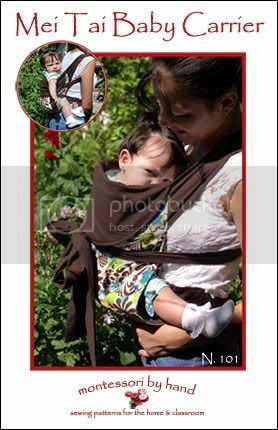 Meg’s Baby Carrier Pattern. It’s so pretty and so functional, perfect for moms on the go, and it would make a great Xmas pressie. Meg: Two of my patterns, the Reading Pillow and the Mei Tai Baby Carrier, are available for purchase at my website, www.montessoribyhand.net or at my Etsy store – www.montessoribyhand.etsy.com. In addition, they will soon be available at Sew, Mama, Sew and many other online and independent sewing stores throughout the United States. I make almost all my sales through PayPal. At first, I was selling electronic versions of my patterns through a service called PayLoadz, but I am excited to be transitioning to printed patterns. Even though I live in rural Mexico, which prevents me from packaging and sending off orders myself, I am fortunate to have the help of my parents who live in California. Until my husband and I move back to the United States this coming summer, my dear dad, a recent retiree, is acting as my stock boy! All of my orders will be packaged and shipped off by this ex-geotechnical engineer, with my mom providing the quality control on the bow tying, etc. Meg: Oh boy. I like that “what were you doing before?” line, which implies that I gracefully waved adieu to my previous career in order to focus on my pattern designs. Ha! In reality, I juggle two jobs – by day I’m a full-time Montessori teacher in a one-room school house in Creel, Chihuahua, Mexico. By night I’m a crazy (and very tired) pattern designer, craft enthusiast, and above all, servant to two very demanding felines - one of which sometimes helps me model my Mei Tai Baby Carrier, given that I don’t yet have any babies of the human variety. Awwwwww! 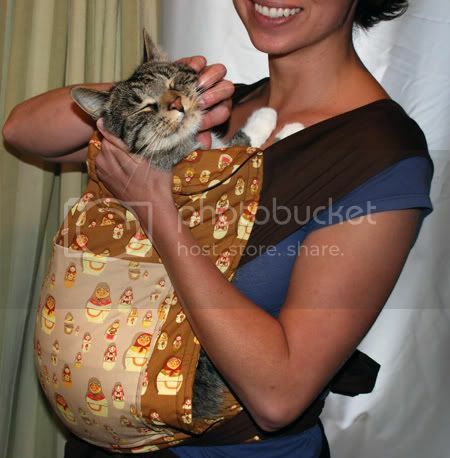 Mei Tai Baby Carrier as modeled by mum and a very comfy pet cat. Have you noticed how many crafters seem to have cute pets as well? In reality, this is a blissful and symbiotic mix. My patterns represent a melding of two of my passions: child-led, discovery-based education and sewing. It is my desire to provide sewing patterns that offer unique ways to enrich the lives of children and their families. A big motivation for selling my patterns is the hope that I will be able to earn enough money from my sales so that I can stay at home once we have a baby, even though my husband will be bringing in those big-time bucks as a grad student! Meg: I began by selling three of my patterns as e-patterns, PDF files that my customers could download directly to their computers. This worked out quite well for me, as I was able to use these earnings to pay for the (somewhat substantial) cost of having my patterns professionally printed and sold in sewing stores as real, full-sized products. I highly recommend selling your patterns as downloadable files first. It allows you to get a sense of what will sell, what instructions might need tweaking, and most importantly, it can help you set aside start-up funds so you don’t have to empty your savings account to start up your small business. In order to sell online files, I recommend using the services of Payloadz or E-junkie, which work with PayPal to safely store and deliver the files once a purchase is made. Megs’ Reading Pillow in action. Meg: I get a really good sense about what might make a good pattern by the response I receive at my blog when I post a picture of the product. 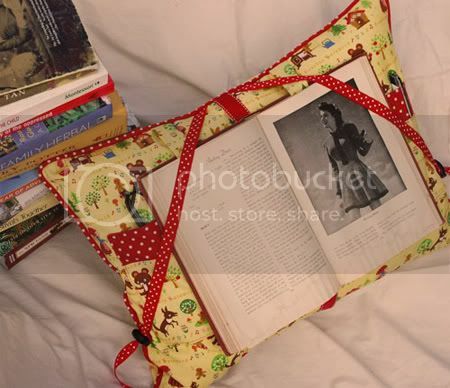 For example, my reading pillow was an instant hit among my readers, as well as on Flickr groups. I knew that this would be a successful product! Meg: I remember the morning well – I contacted Kristin of Sew, Mama, Sew about the possibility of carrying my patterns in her store. She responded with an encouraging “yes!” and my vision from that moment on grew substantially broader. 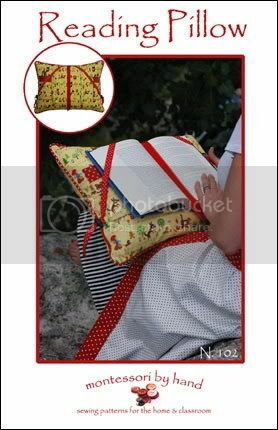 It was then that I decided to have the patterns printed professionally and offer them to interested sewing retailers. Meg: Although my blog didn’t start off with any of this “pattern business” in mind, it has turned out to be a lovely way to get the word out about my patterns. I have a mailing list associated with the blog that I’ve put together (I use www.ymlp.com as my provider.) I’m also on Flickr, where I post my pics to various groups. Another positive tool has been my participation in various Yahoo groups and sewing forums, including my own , where many crafty mamas hang out and share advice. I’ve also written tutorials and articles for Whip Up, where I link to my website. And last, but not least, I have complied a mondo email list of quilting/sewing stores with the help of my friend, Google. This is the list that receives my promotional emails and information on how to order my products. CraftBoom! What things do you know now that you wish you knew from the beginning? Meg: I wish I knew how helpful all of my fellow craft entrepreneurs were! After getting over my nervousness, I went ahead and contacted them and, guess what? They responded right away and provided excellent tips and advice. Meg: I love getting paid for my need to create, but most of all, I love knowing that my pattern designs have the potential to make the life of family a little brighter. On the downside, I dislike dealing with certain “techy” details such as web maintenance, etc. Thankfully, my wonderful husband, Patrick, is super helpful in this arena. I couldn’t do it without him! 1.) Jump in, and don’t hesitate to contact other entrepreneurs if you have questions! 2.) If you want to publish your own patterns, consider familiarizing yourself with a professional layout program such as Adobe InDesign. It pays to sit down and go through the tutorial once or twice. 3.) Decide how much time you are willing to put into your business from the get-go. Time can either be your best ally or your worst enemy. If you stick to your parameters, you will be able to produce more in less time, and you will be able to maintain a balance in your life. Remember to set aside fun crafting time for yourself when you create things that have nothing to do with your business! Crafting should never become a chore. Meg: I haven’t yet reached my goal, but then again, I’m just starting. As of right now, business is looking quite good. Meg: I currently have a number of ideas up my sleeve. Sometime in early 2008, I plan to make available the next two patterns in the Montessori By Hand line – a Child’s Apron and a Child’s Painting Smock and Art Apron. So many ideas, so little time! How cute is this Painting Smock? One of Meg’s arty students modeling the upcoming smock, just the thing to make your classmates a bit envious! All of this depends on my plans for a future growth (ahem, I mean baby) in my belly! Hopefully the pattern sales will go really well, and the most important “growth” phase can begin! This is another great interview, so inspiring to read. “Cute” doesn’t even begin to describe that painting smock! Adorable! And I’m not usually one to make things like that reading pillow, but it looks SO functional and practical, I may just have to give it a whirl! Great interview, Lisa and thanks, Meg! I just purchased the reading pillow pattern…it looks GREAT!! I can’t wait to see what else Meg has up her sleeves. I love the smock! And the reading pillow! Added her blog to my regular read too, I love the Montessori method and wish we were closer to a school for my kids. Not to stary too far away from the topic, I just want to mention real quick that E-junkie is not just a digital delivery service but a full service shopping cart for digital and tangible items. Stefanie on Etsy as your Craft Business - this week’s fave Etsy shops. joanna on Etsy as your Craft Business - this week’s fave Etsy shops. Etsy as your Craft Business - this week’s fave Etsy shops. | CraftBoom! on E-junkie the stunningly simple selling solution for Craft Businesses - Exclusive Discount! Kim on Etsy as your Craft Business - this week’s fave Etsy shops.